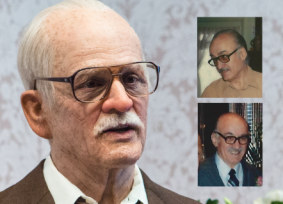 FOXNEWS.COM: Meet the Real Grandpa Behind the Oscar-Nominated "Bad Grandpa" - ALTERIAN INC.
Johnny Knoxville’s elderly character in “Jackass Presents: Bad Grandpa” was based on an actual person, says the film’s makeup effects designer Tony Gardner, whose company’s work in the film has been nominated for an Academy Award this year. Johnny Knoxville’s old man character first sprang to life in 2001 on the “Jackass” television series as more of a disguise for Johnny Knoxville’s antics. “Then, when Johnny was paired up with an elderly actress named Dottie Barnett as his character’s wife for the first film, we decided to lighten up the old man’s look, and actually re-sculpted several of his facial prosthetics with less intense features. For the finale sequence of the first feature, ‘Jackass: The Movie,’ we were tasked with putting all nine of the cast members into old age prosthetics as elderly versions of themselves, including Johnny, so we ended up altering Johnny’s prosthetic makeup yet again so that the new version was more of a physical match to Johnny’s features.”“’Irving Zisman proper’ was actually created in 2006 for ‘Jackass Number Two,'” said Gardner. “Johnny was up for going into prosthetics again for the sequel to the first film, and Producer Spike Jonze wanted to get involved in the antics as an old lady, so … the characters of Irving Zisman and his lady friend Gloria were born.”The intent with Irving for ‘Jackass Number Two’ was to revise him to make him a kindler, gentler Grandpa figure, but one that was doing things that weren’t so kind. One of the skits for the 2006 film (titled appropriately “Bad Grandpa,” http://alterianinc.com/jackass-number-two-johnny-knoxvill…), involved Grandpa and a child actor out and about town, messing with the unsuspecting public as grandfather and grandson, so the goal was to make Irving even friendlier than he’d been so far. The need for a solid, softer Irving for “Jackass Number Two” was where the real-life Grandpa reference came into play.